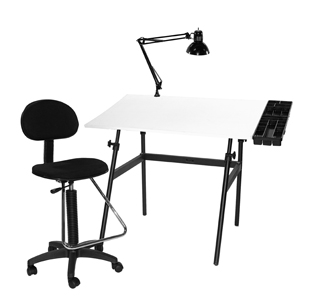 This combination package provides a total working environment with a drafting height chair on casters in a functional and stylish white, large work surface in white with a total table top measuring a total of 30” by 42”, a convenient side tray for tools and other materials, and a white enameled steel base using the popular folding table. Manufactured by the well-known and respected Berkeley, these items will provide years of durable and reliable use. This amazing price allows purchase of multiple packages to outfit any work area, class room, or studio. Style and functionality were never more affordable than as with this combo offering. The table folds for easy movement or storage. These elements are packaged as flat packs to save on shipping costs. Assemble is necessary using basic tools. Oversize Shipping costs are $57.45.